Part One - What? and Why? In Part One, I describe what I mean by Visual Analytics and explore its current usage (or lack thereof) in the grocery retail sector. I then look into some of the reason I feel it is underutilised and also why visual analytics is such a great fit for the retail. In Part Two, I discuss how we can (by overcoming previous obstacles) make data visualisation the standard method for analysing information (and making fact-based decisions). 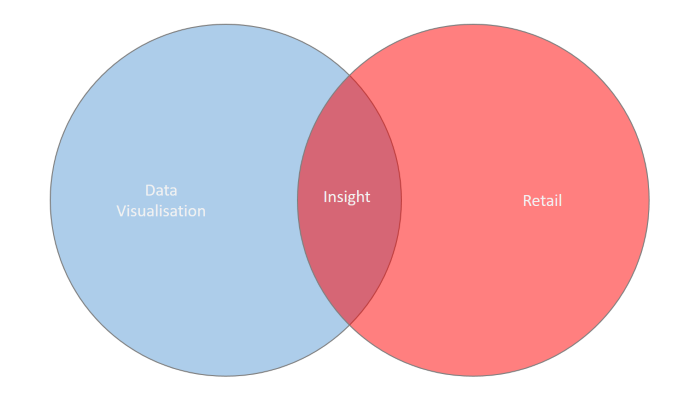 This looks at how the knowledge (and expertise) of both the retail specialist visual data analyst and the business expert come together to augment the intelligence of both, through the power of data visualisation. Part Three - What does that look like? In Part Three, we roll up our sleeves and get down with the data! I show what the combination of domain expertise looks like, in practice. I do this by running through a 5 minute exert from a workshop, for a recent project we've been doing. This demonstrates the advantages of visual analytics (over traditional methods) to answer complicated business questions, and derive the holy grail of actionable insights.